This hand stitched wall art is a creative piece of textile art that reminds me of flaking paint, hence the descriptive title. To make it I painted a piece of Bondaweb, which is fabric glue, fused onto a piece of my hand dyed cotton fabric, then stitched by hand using contemporary stitching. I have used a variety of embroidery threads to stitch in a variety of thicknesses that add a rich texture to the piece and give the effect of flaking paint to continue the theme suggested to me by the original acrylic painting on fabric. I have used gorgeous blues, copper and gold in my work. 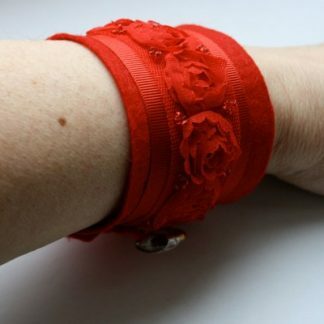 This piece also uses beads, sequins and wire – no little fingers please. This is a unique handmade item as no two pieces are ever quite the same. I have called it ‘Flaking Paint’. 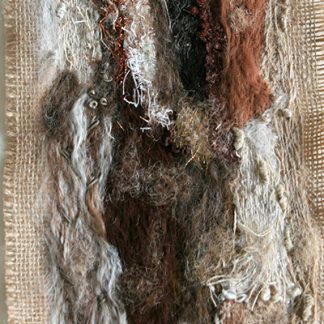 As a textile artist I explore emotion and intuitively stitch to create my unique wall art. You are purchasing a piece of unique textile art, that is really three pieces of art in one – original acrylic painting fused to hand dyed fabric with unique contemporary stitching. 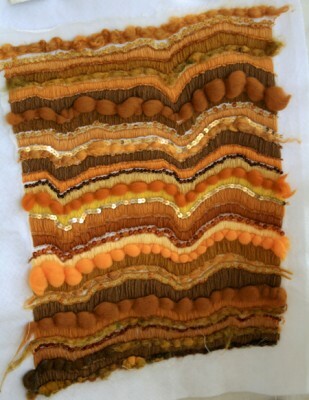 This piece of textile art is on a piece of pure cotton, which is hemmed. The stitching goes almost to the edge of the piece. You might frame it or mount it. You are buying the hand stitched art only. It can be used as is and makes a very original piece of wall art. It could be used to make a bag or a centre piece for an innovative quilt for your own personal use. The piece measures 46 x 21cm (18 x 8 inch). This work of art comes with a certificate of authenticity.